Thinking this is potentially a good 1 of for Dredge. In cases where your opponent removes your bridges but does not have total graveyard removal (sac creatures for instance) this can come in with an army off dread return, and likely allows you to use another return afterwards to pull Flame-Kin for an alpha strike. 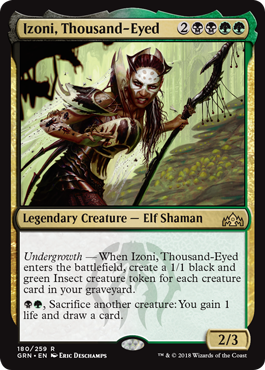 The only thing holding it back a bit is that the insects are ground creatures, though if they were flying this might be nutty in other formats. I like Varina, the Lich Queen better at least in a Pitch Dredge variant. Still seems a bit "win-more"? This is probably worth testing, but my intuition says its worse than other current options as far as return into extra creatures is concerned (Sun Titan still #1). @vaughnbros I just wanted to call that out as exactly the correct response to this kind of spoiler.